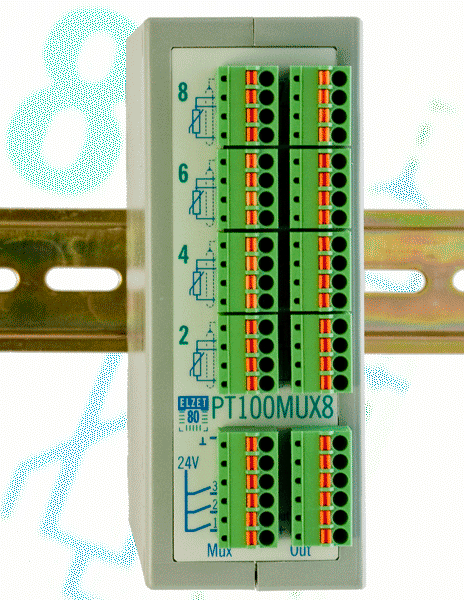 Use this multiplexer to connect up to eight Pt100 RTDs to any PLC with a standard analog input, not just to an ELZET80 controller. You gain higher precision and compensation of line influence and save on expensive analog inputs. Internal linearization and range adjustment allows to use the best possible resolution on your application's temperature span. 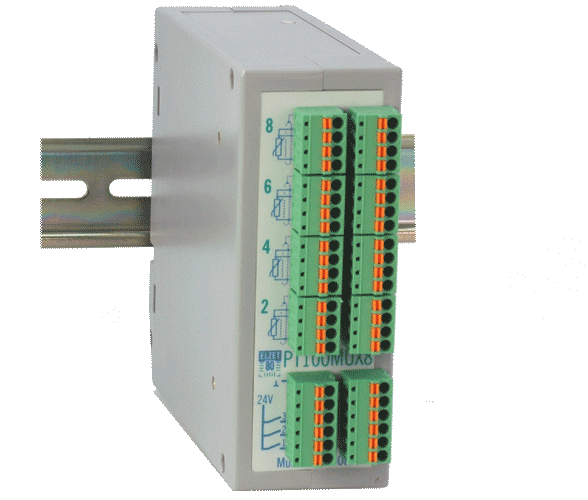 Pt100MUX8 comes in 4 pre-set temperature range models and is available with custom ranges, too. 2-wire 4..20mA output, works with a PLC voltage input, too, using precision load resistors. Pt100 multiplexer for 8 sensors with temperature range -40°C...+123,8°C. Current output 4..20mA. Includes all plug/screw terminals. Pt100 multiplexer for 8 sensors with temperature range -25°C...+302,6°C. Current output 4..20mA. Includes all plug/screw terminals. Pt100 multiplexer for 8 sensors with temperature range -150°C...+505,25°C. Current output 4..20mA. Includes all plug/screw terminals. Pt100 multiplexer for 8 sensors with temperature range 0°C...+819°C. Current output 4..20mA. Includes all plug/screw terminals. Pt100 multiplexer for 8 sensors with custom temperature ranges. Requires one time fee of 100.00 €* to calculate and procure special parts. Current output 4..20mA. Includes all plug/screw terminals. Pluggable screw terminal set consists of: 8x FK-MCP1,5/4-ST-3,81, 2x FK-MCP1,5/6-ST-3,81. The device can be ordered without screw terminals at 20€ less. Shunt resistor 500Ω 0,025% to control a 0..10V voltage input. Usable effective range 2..10V. Shunt resistor 250Ω 0,025% to control a 0..5V voltage input. Usable effective range 1..5V. Shunt resistor 50Ω 0,025% to control a 0..1V voltage input. Usable effective range 0,2..1V. 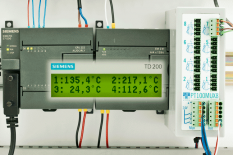 Pt100 RTD inputs often are a scarce ressource on industrial controls. If at all there are Pt100 inputs, there are usually just 2 or 3. Which is based on the fact that Pt100 sensors require a higher effort than other temperature sensors as the resistance change is rather small. ELZET80-Pt100MUX8 allows up to eight Pt100 Sensors to be read from any controller with a single standard analog input - either a 4..20mA current input or even a voltage input by using a matching load resistance. Resistors are available for 1V, 5V and 10V input ranges. 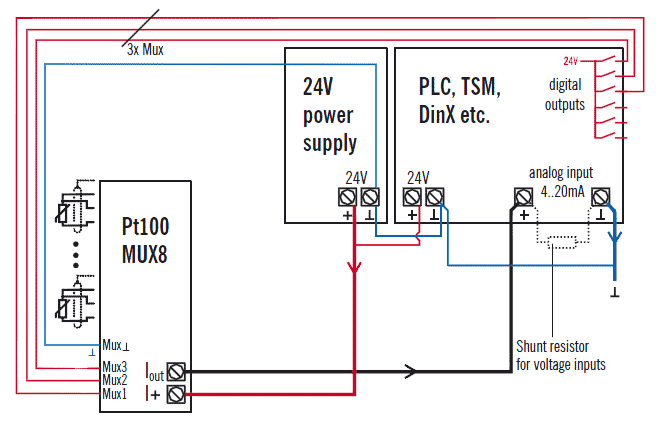 24V power supply of Pt100MUX8 is through the 2-wire-output-loop cable. Three 24V digital inputs are available to select one of the 8 sensors to be applied to the accurate amplifier- and linearizer circuit. Settling time to full accuracy is 2ms. As Pt100 sensors are temperature dependent precision resistors, the influence of the line wire resistance can be considerable. Hence a sense scheme is supported that uses 3 wires, effectively allowing compensation of the line resistance by measuring the resistance of the wire itself. Pt100MUX8 generates a reference current of 1mA, to be able to detect the voltage loss over the sensor resistor. This voltage gets amplified and linearized to the output level of 4..20mA. Current consumption: max. 4mA from the 24V of the output loop. 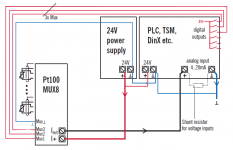 Output current: 4..20mA, can be transformed into different voltages using an accurate (!) load resistor at the controller's input (50 Ohms min., typical PLC has 250 Ohms = 5V, max. 500 Ohms = 10V full range). Optionally, load resistor can be integrated into Pt100MUX8, then however, line resistance adds imprecision to the output signal which is also more susceptible to EMI. 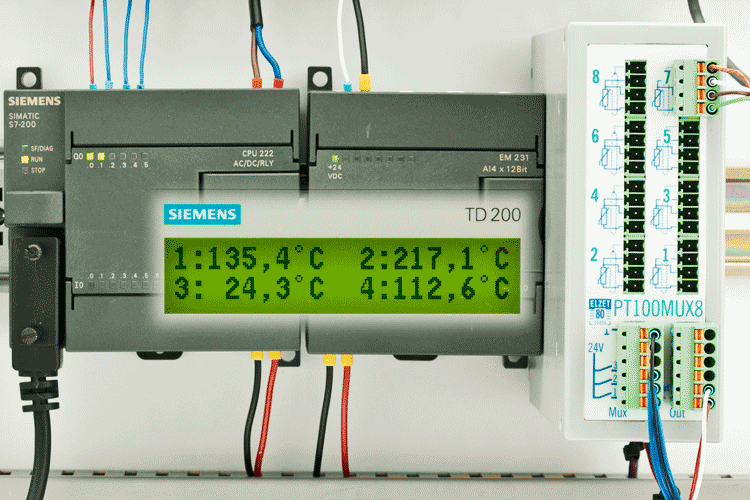 Small PLCs often have an insufficient number of analog inputs. You can save on an additional analog modules by using Pt100MUX8 for your RTD inputs, gaining far better performance at a lower price. We are happy to help you through the installation, just let us know.